Chris Carpenter was supposed to be that guy for the 2011 Cardinals, especially after co-ace Adam Wainwright headed for Tommy John’s surgery in spring training. In 2009, Carp had 17 wins. In 2010? 16. He has a 3.07 earned run average since joining the St. Louis staff in 2004. He’s been the guy just about every time he was needed (when he wasn’t hurt, of course). And we expected nothing less — and possibly even more — from him this season. Carp’s willing-to-work attitude has him throwing 130+ pitch complete games. Can’t say there isn’t value in that! Wednesday was his last start in June and he earned his third win. Now, without spending an entire post rehashing how he got to 3-7, I would instead like to explain why I still believe he’s been crucial to this team’s sometimes-ugly-but-effective success. Basically, how he’s still, in some ways, everything an ace should be … even without the sparkling win-loss record. Anyone who has payed the slightest bit of attention to the Redbirds this season knows that defense has not been a strong suit. The team currently sits 7th in all of the Majors in errors (with 54, in case you were curious). And even the 2nd-ranked team offense hasn’t been able to string together runs when Chris is on the mound. Yes, he’s had a couple of off days. He was rocked onÂ April 12th when he gave up eight runs in four innings to the Diamondbacks. He gave up seven runs on May 15th to the Reds. That one was painful. But despite all that, there are only two games this season where Carp has gone less than six innings. It’s also no secret that our haphazard bullpen has been, well, a bit of a disaster zone. So any way we can avoid taking the risk of using a handful of relievers is worth trying … even if it means pitching CC into the 8th when he’s clearly not in 20-game-winning form. Chris himself said earlier in the season that he’s played a lot of roles in 14 seasons in the Bigs. But it impressed me when he said he was willing to play the part of the workhorse — the guy who toughs it out, no matter what. The guy who has just plain bad luck, but keeps plugging away. 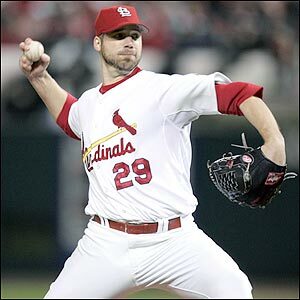 Plus, he’s Chris Carpenter. He’s going to get better. He’s smart about his game. He’s as tough a competitor as you’ll ever find. (Johnny Cueto, he’s coming for you next! )Yes, he likes to talk sometimes, but through his struggles, he’s kept his mouth shut and worked hard to find the Chris Carpenter magic we’ve grown to love. And his 5.12 ERA from May dropped to 3.00 in June. In the same month, he’s thrown two complete games, and in his last three starts he became the first Cardinals pitcher to throw 124+ pitches in three consecutive games since the 1950s. Let me just say, this guy’s a beast! In the era of sub-100 pitch count limits, Carp’s durability has been critical in resting (or simply not using!) the bullpen. Not too many guys out there take the ball night after night, knowing something isn’t clicking, but also knowing his team and his organization believe he’s the leader they need to continue to contend. Cardinals Insider Brian Stull even discussed CC’s “old-school” philosophy when he mentioned Wednesday’s 132-pitch win. Stull said it and I’ll say it again — Chris is a workhorse, and the kind of “old-school” thrower we need. He’s not afraid to go after it and get the job done, whatever the result. The rest of the rotation has stepped up, it’s true.Â But it would be tough to debate who the emotional leader of the staff is. He’s the veteran. The one who’s been there — wherever “there” happens to be that day. And his presence alone has helped shape guys like Adam Wainwright and Kyle McClellan. Carp may not have the win totals we’d like to see, but make no mistake, he’s still a leader on this team, and a value to the rotation. So while his numbers may not say he’s the “best pitcher on the team,” he plays with heart and that’s something no stat line can measure. Maybe now his recent trend will continue and our old team-best ace will start racking up the Ws. But maybe, he’s still our “ace” anyway … our ace in disguise. Yes, he’s Chris Carpenter! (OK, no italics here.) He has pitched far, far better than his record for the majority of the season — he has just had really terrible luck. Glad to see that he’s finally getting the breaks going his way. I don’t know about this, but President Obama needs to get on the phone with Chris Carpenter right away. Carp throws a complete game win, and suddenly, this company is hiring 130 new people. Awesome. Chris Carpenter Does Not Give a F*** About Economic Recovery. I was going to delete this spam comment … guess I won’t! You’re right, CC does not give a f*** about economic recovery. If he did, there would be more than 130 new jobs being created. And I wish he would give a f*** about Internet spammers and get rid of them. He totally could, with one of those glares of his. OK! Chris Carpenter is the bomb and it was only a matter of time before he channeled that anger he has into good pitching. That’s right… He don’t give a F*&# … And that’s why he’s awesome!